Hip Blues Blast readers are in the know about who Jimmie Vaughan is and his importance to the Blues world. But, for any uninitiated, Jimmie Vaughan is one of the greatest Blues guitarist of all time. Throughout his long influential career he has been a torchbearer (along with contemporaries such as Ronnie Earl, Duke Robillard and John Primer) for clear authentic electric guitar sound. Vaughan’s Blues is a Texas hybrid of R&B, shuffling two-step and greasy Chicago, with a hint of New Orleans groove for seasoning. Jimmie developed this style early on with musical partner Kim Wilson in The Fabulous Thunderbirds and has grown and innovated since he started his solo career in the early 90’s. 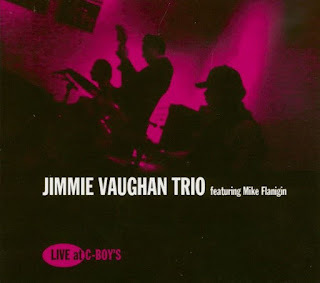 Mr. Vaughan is a generous collaborator and a humble band leader which is reaffirmed in his newest album Live at C-Boy’s. 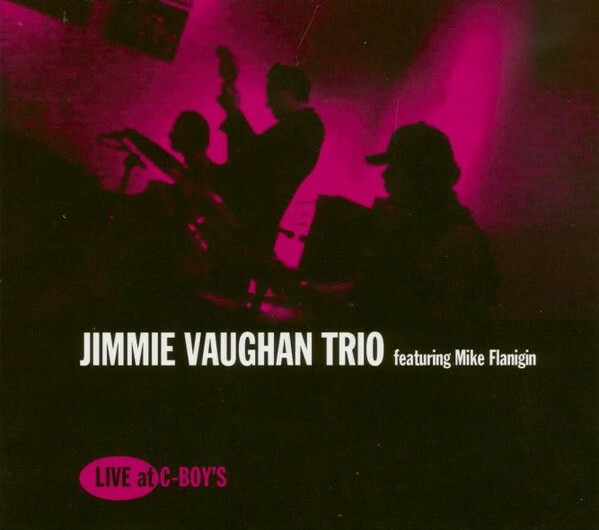 Attributed to the Jimmie Vaughan Trio with the subtitle “featuring Mike Flanigin” this record is a document of three Austin, TX legends chilling and having a great time communicating musically. The song selections are almost immaterial, it is the unique contributions of Vaughan, Hammond B3 master Flanigin and dearly departed drummer Frosty Smith that make this 36 minutes of organ trio Soul Jazz shine.